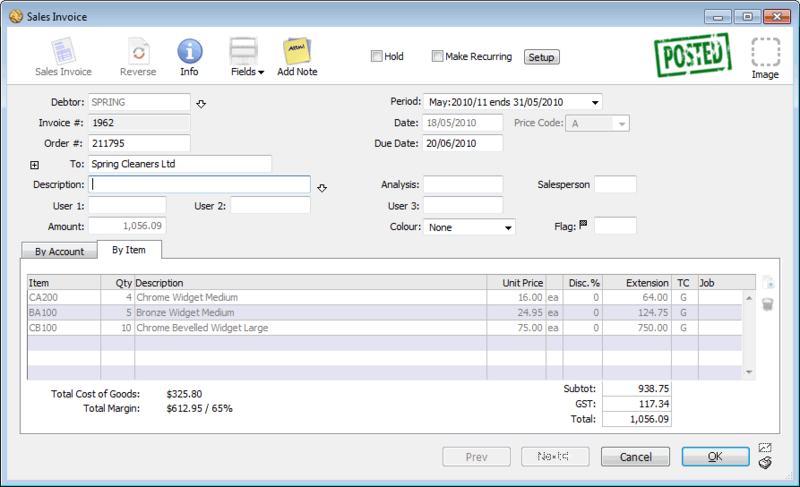 You can modify and delete transactions in any of the tab views of the transaction list window. However, to maintain system integrity, there are certain restrictions imposed on modifying and deleting transactions. Up until a transaction is posted, you can change any of its details. Once a transaction has been posted you can only change the non-accounting details, including To, From, Description, Analysis, Flag, Colour, MailTo, DeliverTo, User fields and recurrence settings. Other fields are locked. The transaction entry window for the first of the highlighted records will be displayed. The fields that cannot be altered (because the transaction has been posted) are displayed in grey. To modify a single transaction, just double click it in the list. The current data in the field will be highlighted ready to be overtyped. Click the mouse to get an insertion point within the highlighted area if you only want to add or delete a few letters. If you are modifying a number of transactions at once, use the Next button to save the changes to the current transaction and display the next one to be modified. Click OK when you have reached the last transaction to be changed or when you want to finish modifying transactions. To save the current transaction and move back through the selected transactions, click the Previous button. Note: If you have altered a posted transaction, you will be asked for confirmation. If you choose to save the changes, the transaction is tagged as having been altered since posting (this can be seen in the Get Info window.